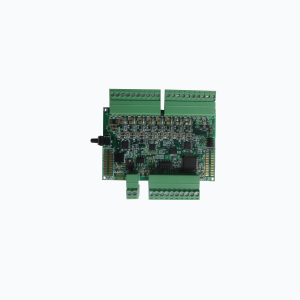 The Intelligent Analog Input Module contains 12-bit ADC resolution Up to 8 Channels single-ended inputs with User programmable has a sample rate of up to 1MSPS, with ESD, EFT and Surge Protection circuits at Analog section. The ADC IC is controlled from the Master controller which is from Freescale Kinetis K series is a 32-bit ARM Cortex-M4 core with DSP instructions communicated through SPI interface to ADC IC. It runs at up to 8MHz. Either Voltage Inputs/Current Inputs individually configured through Hardware whereas the voltage and Current levels are software Programmable for individual Channels. Plug-in Screw Terminal Block 3.5mm Standard. Pluggable to Gateway Controller of Cascademic Modules such as Bluetooth,WIFI, and Telit for easy Transmission of data Remotely.